BART riders exhibit a peculiar queueing behavior which differs from most subway systems across the world: riders politely line up at door markings rather than waiting closest to the side of the destination platform. While this practice offers a façade of decorum prior to cramming onto overfilled trains, the long, meandering lines result in an inefficient use of platform capacity that restricts circulation. During peak periods, lines extend across the entire platform adjacent to large swaths of empty spaces between doors, making entering and exiting the platform unnecessarily difficult. 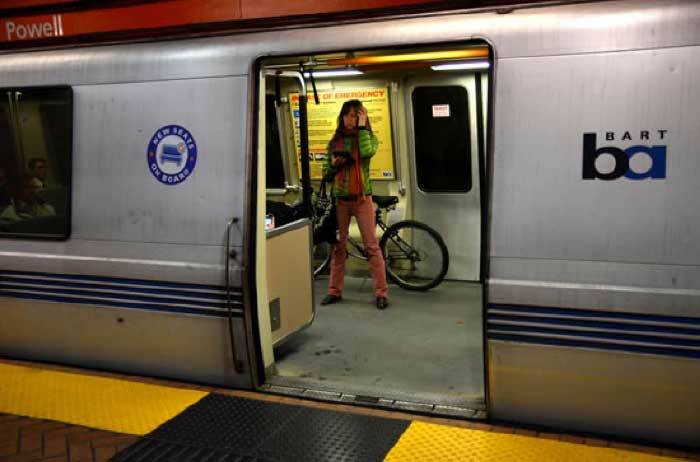 While BART recently identified capacity improvements for overflowing stations like Embarcadero and Montgomery, a review of the efficacy of door markings was not included. Door markings are a necessary evil to serve BART’s existing fleet given BART’s two-door trains offer fewer locations to board (in contrast, Los Angeles operates three-door trains, while New York City operates four-door trains). However, BART’s new three-door trains present an opportunity to improve the efficiency of its platforms by eliminating door markings. With a 50 percent reduction in distance between train doors, door markings will no longer be needed to guide passengers. The elimination of door markings and associated lines would significantly improve station capacity and circulation for overcrowded stations like Embarcadero and Montgomery: lines would no longer block the entire platform as riders would queue closest to their destination train. Unfortunately, it may be a while before BART eliminates platform door markings. Even though BART began the procurement of new train cars in 2009, the delivery of its full order of 775 cars is not expected until 2022. Even then, BART plans to operate a mixed fleet of new and old cars for the foreseeable future until it identifies funding for an additional 306 new cars to reach a full fleet of 1,081. Given the slow rate of implementation, it may be a decade until the last two car trains are phased out. Nevertheless, the benefits of eliminating platform door markings for a system which operates a majority of three door trains outweigh the potential confusion associated with continued operation of some two-door trains. BART should plan to remove platform door markings over the next few years to realize the full benefits of its new train cars for enhancing platform capacity.